The MACone Call Box features all of the characteristics of our standard aluminum call boxes in a rust-proof and corrosion-proof stainless steel enclosure. Made of 316 powder-coated stainless steel and highlighted by a selfclosing pneumatic door, this box is ideal for roadside assistance. Its single button operation makes calling for support easier than ever. 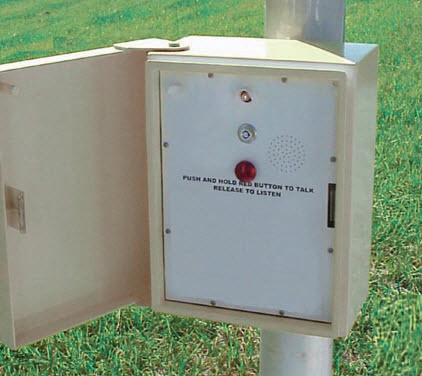 The Call Box enclosure measures 15”H x 11.375”W x 7.75”D and includes ADA compliant hinges for easy open functionality. Available in either AC/DC or 5-watt solar panel options, the box also comes with choice of “ASSISTANCE”, “EMERGENCY” or “CALL BOX” reflective or non-reflective vinyl message decals.